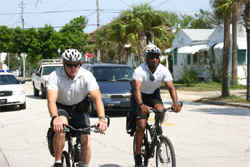 The Daytona Beach Police Department uses police mountain bike patrols as a part of its community policing efforts. Putting police officers on bicycles not only allows officers to get to some calls and locations quicker, but it also provides easier interaction between citizens and officers that may otherwise be in marked patrol vehicles. Bike patrol officers utilize police sub-stations to write reports, make telephone calls and meet with area residents. The Daytona Beach Police Department currently has four officers assigned to the Police Bike Unit. These officers can be seen on daily patrols, as well as assisting with special events such as the Fourth of July fireworks, Martin Luther King Jr. Parades, Bike Week, spring break and the Law Enforcement Torch Run to benefit Special Olympics. The unit supplements the existing patrol force for proactive enforcement in areas where patrol unit access is limited and for special city functions. The Police Bicycle Unit offers both a high and low profile police presence to increase public contact and deter criminal activity. Citizen reaction to the bicycle patrol program has been extremely favorable. The bicycle officer establishes more personalized contact with the community members and is not isolated in a police vehicle. The unit helps to continue a community-oriented style of policing.